What does Windows on SoC mean for Windows 8? The "next generation of Windows" (which Windows president Steven Sinofsky is explicitly not calling Windows 8) will run not only on the familiar x86 CPUs, such as the new Sandy Bridge cores or Intel's latest Atom processors, but also on ARM chips such as as Qualcomm's next-generation Snapdragon, Nvidia's Tegra 2 and on Texas Instrument's OMAP. These are all systems-on-a-chip based on ARM processors, so while Google is reaching up towards Windows territory by putting Chrome OS onto Atom notebooks, Microsoft is reaching down towards smartphone and tablet platforms. The "natively-compiled ARM code" version of Windows that Sinofsky and corporate VP Mike Angiulo demonstrated running on prototype boards with these three ARM platforms is the next generation of Windows (version number 6.2.7867 from the command prompt we saw) and it does a lot of what you'd expect. "Accessories work, customisations work; it all works as you'd expect," says Angiulo, and on the OMAP prototype Sinofsky plugged in an Epson printer and printed a page. "That took a small amount of work from Epson building on top of a new level of class drivers in Windows," he explained, because existing device drivers expect to be running on the x86 version of Windows. "There's a ton of differences that need to be worked through – IO buses and how memory works and how drive controllers work and power management – but this is all just engineering." But the other half of Windows – the reason we want it on ARM-powered devices instead of any other OS – is apps. Microsoft showed Office running on ARM, printing Word documents and using the hardware acceleration in Tegra 2 with PowerPoint and IE9 – but those were specially-written native versions of Office and IE9 for ARM. "We're doing the work in Windows to enable Windows to run on the ARM architecture, and we've shown some of the work we have to do is in the device driver world to enable third parties to build their part of the device driver," said Sinofsky. "But it's definitely the case that x86 programs don't run on the ARM architecture. And it's not likely that you would do virtualisation or things like that, that's not something the ARM architecture is really intended for today." And while Sinofsky promised "we're committed to making sure that Windows on SoC is a rich Windows experience," until Microsoft is prepared to discuss how to write programs for what we're going to keep calling Windows 8 for convenience, we won't know quite how rich that will be. 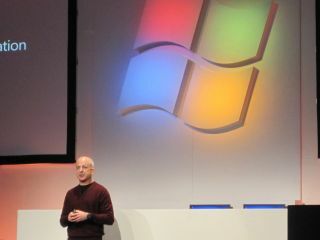 Windows has had these transitions before, Sinofsky reminded us later. "We've had it before with 32- to 64-bit and with 16- to 32-bit. It's more like 16- to 32-bit because there were compatibility issues there," he said. The Windows team is still looking at what customers will want in SoC-based Windows devices. "We have to figure out how to package it, how to position it," Sinofsky told TechRadar. "We have to not oversell it because there will be some capability issues, but that's down the road a bit." Down the road still means "somewhere between 24 to 36 months between releases of Windows"; Microsoft isn't announcing the date for Windows 8 or talking about changes to the user interface. But while Sinofsky noted that he wasn't talking about form factors either ("I could speculate but we're starting the dialog with the partners who make the actual devices"), don't expect a Windows phone that actually runs Windows: "Windows Phone 7 is uniquely focused on the small form factor that Windows doesn't focus on." And with only the smallest of swipes at Google and Android ("at least two of the other two players in the market also have two operating systems each"), he pointed out that "figuring out the boundary [between PC and phone] is something the whole industry has to think about". Sinofsky did call attention to the fact that it's going to be easy for an ARM-based Windows device to have high-definition video. "We're showing all hi-def through the whole channel and this is something you don't see today on many mobile devices," he commented (about half an hour after LG showed off its Optimus 2X Tegra 2-powered Android phone with 1080p video and HDMI, perhaps proving his point since Nvidia CEO Jen-Hsun Huang called that a superphone). The obvious advantages of ARM chips, and of SoCs in general, is how small they are, how much cooler they run (so you don't need a fan), and how much less power they use. That's how the iPad can get twice the battery life of the best Windows tablets we've seen. Slate, netbook, notebook or any other form factor the OEMs can dream up, Windows 8 PCs on ARM could have 15 hour battery life and still be thin and light (and not get too hot to hold). With fewer separate parts, they could be more reliable, and they can still have all the ports and connectors and device drivers you're used to in a PC. What's going to dictate whether that's really the best of both worlds is how many of the apps we want Windows for make it onto the ARM version of Windows, and that's what we have to wait to find out.